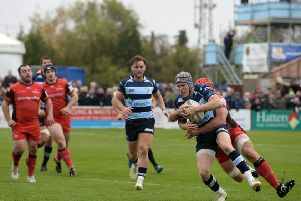 The top ten in National Two North clashed on Saturday - and Ampthill fell to a close one-point defeat. Comfortably the most competitive game of the season, Hull Ionians and Amps went at each other hammer and tongs for 80 minutes with A’s having the better of the first half with the roles reversed in the second. Had either side been more accurate in the final third during their period of dominance the scoreboard might have been busier. As it was Hull edged it 7-6 to bag the top spot. Amps’ squad saw five changes in the pack, three in the backs and three on the bench from where Stuart Livesley made his debut. The visitors started well with fly half Joseph Tarrant converting a second minute penalty goal after I’s were penalised at a breakdown. It seemed that the home side hardly got out of their half for the next 20 minutes or so. Centre Brendan Burke broke the line with a show and go and with a 2 on 1 near the home 22 it seemed easier to score tbut the chance went begging. Full back Elliot Clements-Hill attempted a 55m penalty goal which had the distance but not the direction while Tarrant sent a 25th minute penalty wide of the posts. The second half began as the first had finished, Ampthill defending against repeated forward based attacking play from the home side. On 49 minutes Ampthill, on the attack, turned over the ball deep in the Ionians half, the break resulted in a 5m scrum with the visitors having the put in. I’s produced their best drive of the game, the ball squirted out the back and the hosts’ open side flanker was quickest to react to touch down for their fly half to succeed with the conversion. A’s redoubled their efforts. Eventually Clements-Hill was successful with a 63rd minute penalty leaving the home side with a slender one point lead. The last 20 minutes saw the same pattern with defences snuffing out any real chance of scores from either side while the palpable tension both on and off the pitch could be cut with a knife. The game might not have been a spectacle but it was enthralling. Amps return to action at home on Saturday when they host fourth-placed Chester.